CELEBRATE 4 DECADES OF THE QUADRUPLE PLATINUM "POINT OF KNOW RETURN"
FEATURES SMASH HITS "DUST IN THE WIND" - "CLOSET CHRONICLES" - "PORTRAIT (HE KNEW)" & "POINT OF KNOW RETURN"
In 1977, superstars Kansas delivered one of their biggest multi-platinum albums in their extensive catalog with the mega classic "Point Of Know Return." Featuring the stunning title track and the hugely successful "Dust In The Wind," both remained at the top positions of the charts for the better part of 1977 and 1978, further cementing this bands importance to audiences worldwide. Featuring the original line-up of Steve Walsh, Phil Ehart, Kerry Livgren, Robby Steinhardt, Rich Williams & Dave Hope, "Point Of Know Return" included more incredible Kansas champions like "Portrait" "Close Chronicles" and "Hopelesly Human." Friday Music is very pleased to announce Kansas' "Point Of Know Return - 180 Gram Gold Swirl Vinyl - Anniversary Edition." Impeccably mastered by Joe Reagoso at Friday Music and pressed at RTI , this amazing prog-rock multi-platinum masterpiece will become one of the most anticipated classic rock vinyl revisits of the year! 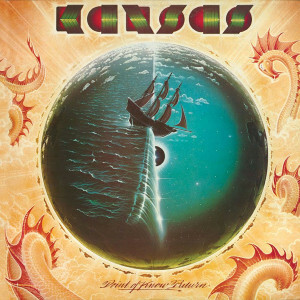 In 1977, superstars Kansas delivered one of their biggest multi-platinum albums in their extensive catalog with the mega classic Point Of Know Return. Featuring the stunning title track and the hugely successful hit single Dust In The Wind, both remained at the top positions of the rock and pop sales charts for the better part of 1977 and 1978, further cementing this bands importance to both pop and mainstream audiences worldwide. Featuring the original line-up of Steve Walsh, Phil Ehart, Kerry Livgren, Robby Steinhardt, Rich Williams and Dave Hope, Point Of Know Return included more incredible Kansas champions like Portrait (He Knew), Closet Chronicles and the great Lp closer Hopelessly Human. Celebrating 4 decades of this classic Kansas album, Friday Music is very pleased to announce another installment in our Kansas 180 Gram Audiophile Vinyl series with Point Of Know Return - 180 Gram Gold Swirl Vinyl-Anniversary Edition. Mastered by Joe Reagoso at Friday Music and pressed at RTI , this amazing prog-rock multi-platinum masterpiece will be a wonderful addition to your audiophile Kansas vinyl collection. Complete with a limited edition gatefold cover, featuring the LP artwork elements, lyrics and of course the ?ve star mastering you would expect from Friday Music, we believe this stunning new audiophile release of Point Of Know Return will become one of the most anticipated classic rock vinyl revisits of the year!